Just thought I would show you a picture of me at work. Some of the galleries that I carry my jewelry have requested working photos. So we took some the other day. 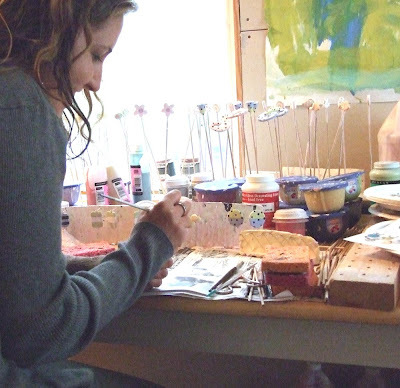 Here I am in my studio working on some beads. When I paint the beads with underglaze they are all on skewers. This way I can turn them around and I don't have to touch anything that is wet. Once I have a bunch of them painted and in my wooden stands, I go back and put two coats of a shiny clear glaze on them. Then......I know so many steps., I gently take them off and clean out the inside of the hole. If I didn't and there was glaze inside the hole, it would stick in the kiln. That is a real bummer, it's happened too many times. For those of you who don't know glaze is basically crushed glass suspended in water. In the kiln the water burns out and the glass melts. So melted glass stuck to a wire isn't going to come off.